Our central forecast therefore still has the Conservatives winning 34% of the vote to Labour’s 32%, but UKIP down to 12% (from 13% last week) and the Lib Dems on 10%. The latest Scotland poll from TNS is very good for the SNP, moving them up a point in our Scotland forecast. Our central forecast now has them winning 47% of the Scottish vote and 51 seats (up from 46% and 49 seats last week). With time running out to pull ahead, the Conservatives’ chances of a majority are down to 8% (from 10% last week) while Labour’s are still just 1%. The chances of a hung parliament are therefore up again, to 91%. Our central forecast has the Conservatives winning the most seats, with 286 to Labour’s 265, but falling well short of a majority. In this scenario, even the Lib Dems and the DUP would not be enough to give them 323 MPs. 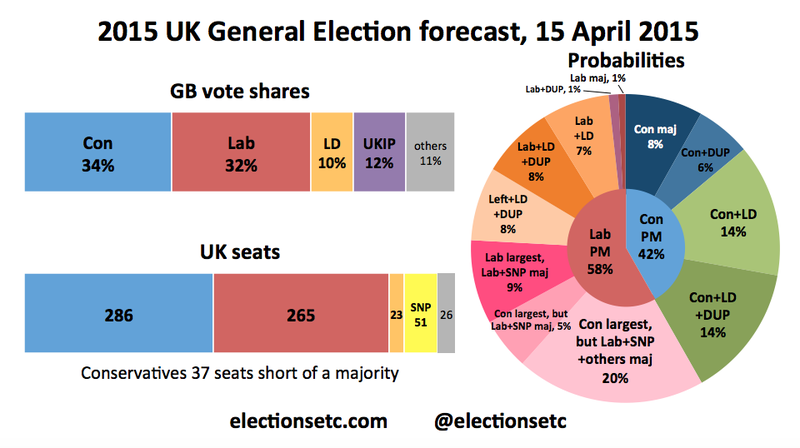 This would put us in the “Con largest,but Lab+SNP+others maj” segment on the pie chart above – an outcome our model gives a 20% chance of occurring. A “grand coalition” in the German style? Ultrahung- I make it 323 to left block (labour, SNP, plaid, greens and SDLP) to 322 Right Block (Conservatives, Lib Dems, UKIP, DUP) so completely impossible for anyone to form a viable government. 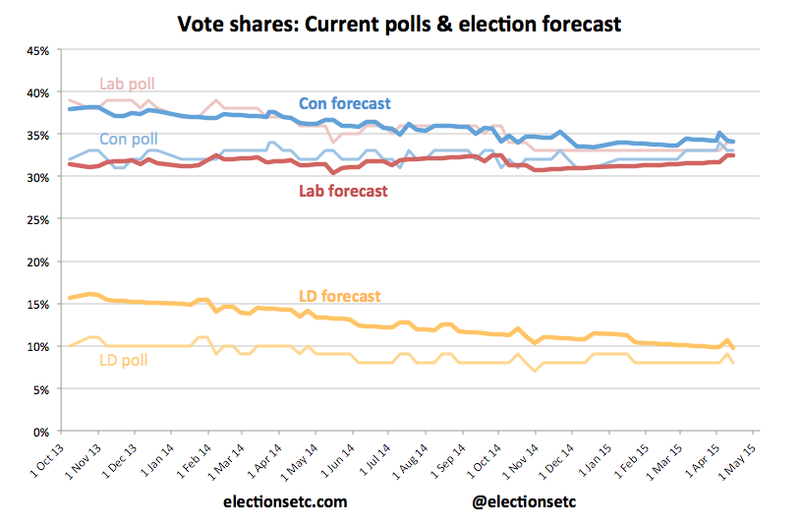 I still think this forecast overestimates the swing the tories will get due to incumbency. In this case, We’d probably be talking a labour minority without a formal coalition agreement with the ‘left block’. Due to SF abstentions, the left block would end up with control, and some loose (and probably short lived) supply agreement in exchange for some leftward concessions. High probability of new election within 18 months or so.